Visual Dimension has worked for several years in collaboration with the Provincial Archaeological Museum and the Provincial Heritage Centre of Ename on the study and the the digital reconstruction of the local heritage: the archaeolgical site of Saint Salvator abbey, the Ottonian church of Saint Laurentius and the in-time evolution of the village of Ename. The results of this collaboration is a series of application permanently on display on site. The TimeLine shows the evolution of the site of Ename, Belgium and the provenance of the museum objects in the archaeological museum. 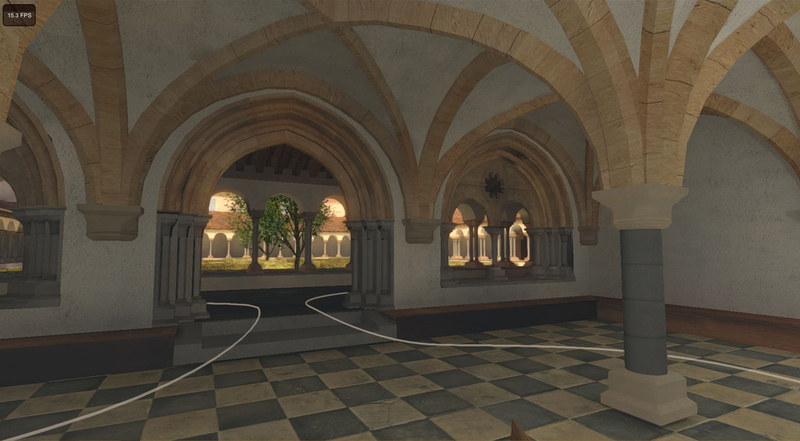 Based on ObjectVR, it shows the new virtual reconstructions of the abbey and village of Ename for 8 periods in time with detailed simulation of the historical landscape. It uses historically correct landscape reconstruction and its evolution that is fully documented and sustainable, but also yields excellent results when virtually walking through the site in the different periods. Several museum objects are visualised interactively and show their digitally restored version and function, next to the real objects. This demonstration is made in cooperation with pam Ename (V-MusT Associated partner). 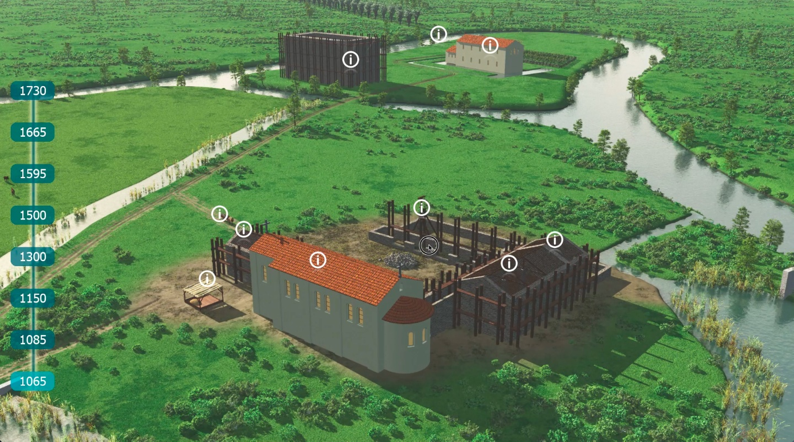 The TimeFrame shows the evolution of the archaeological excavation that took place in the Saint Laurentius church of Ename, and the results of the works of restoration and consolidation of the building. The interactive application is permanently on display in the church itself. 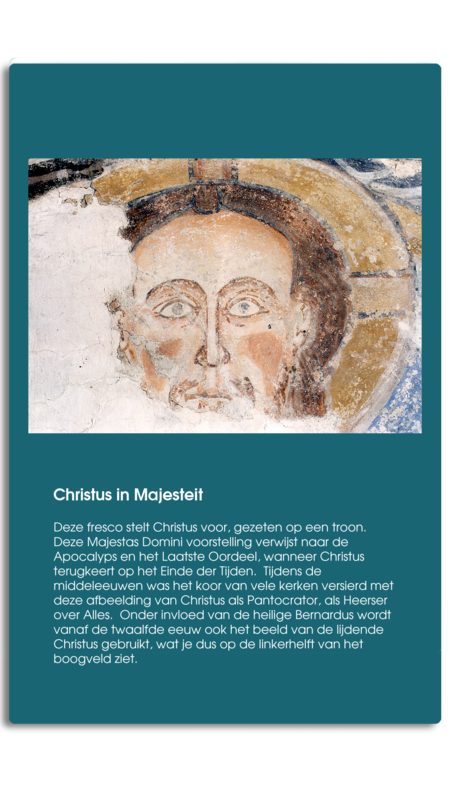 The TimeScope shows the evolution of the abbey site of Ename, Belgium and the provenance of the objects preserved in the archaeological museum. 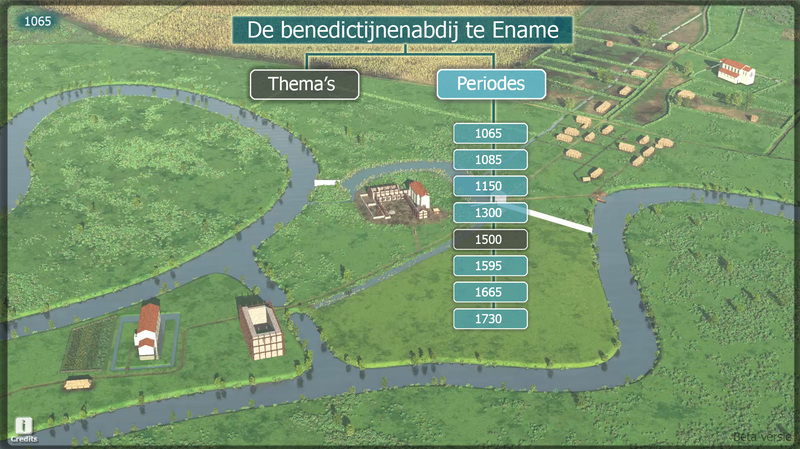 Based on interactive panoramas, it shows the new virtual reconstructions of the abbey of Ename for 8 periods in time with detailed simulation of the historical landscape. It uses historically correct landscape reconstruction and its evolution that is fully documented and sustainable, but also yields excellent results when virtually walking through the site in the different periods. 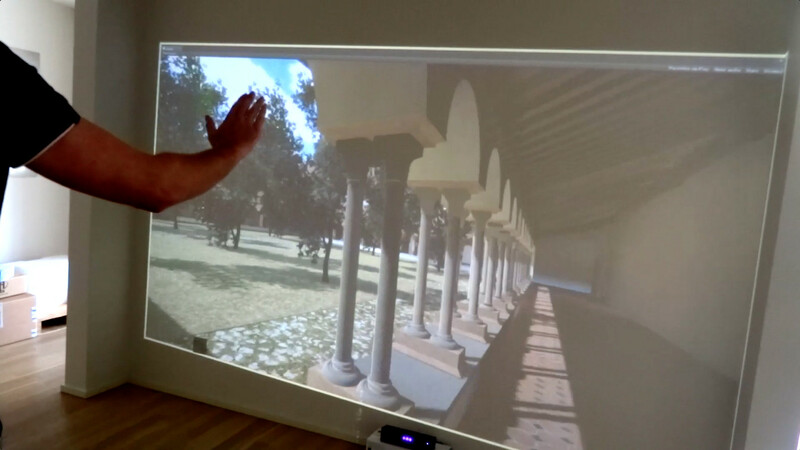 The application is on display on the archaeological site of Ename and it can be used every day from April to November during the opening hours of the museum..
Ename 1290 is a serious game based on natural interaction (Kinect2 sensor). 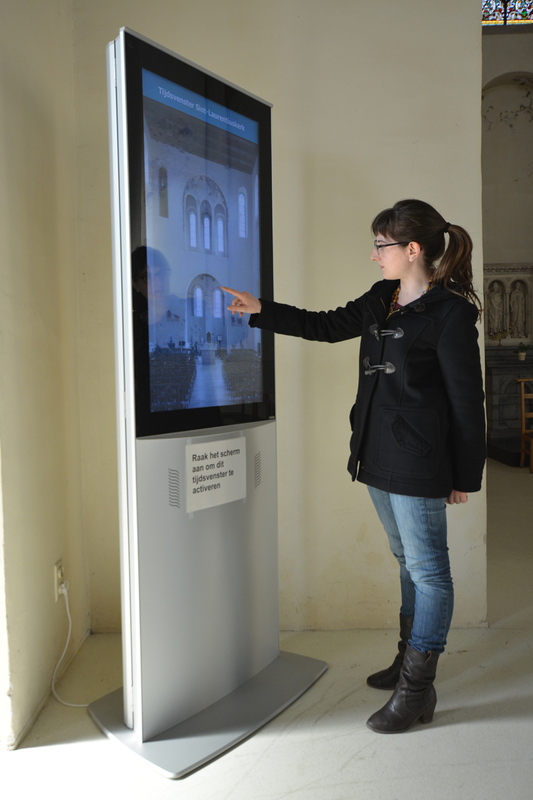 Visitors use gestures and body movements to explore the real time 3D environment of the Saint Saviour abbey in Ename (Oudenaarde, Belgium) in the 13th century, reconstructed both in its architectural decoration and in its furnishing. The game provides the re- contextualisation of the objects that have been excavated at the abbey site and are today on display in the Provincial Archaeological Museum (pam) of Ename. 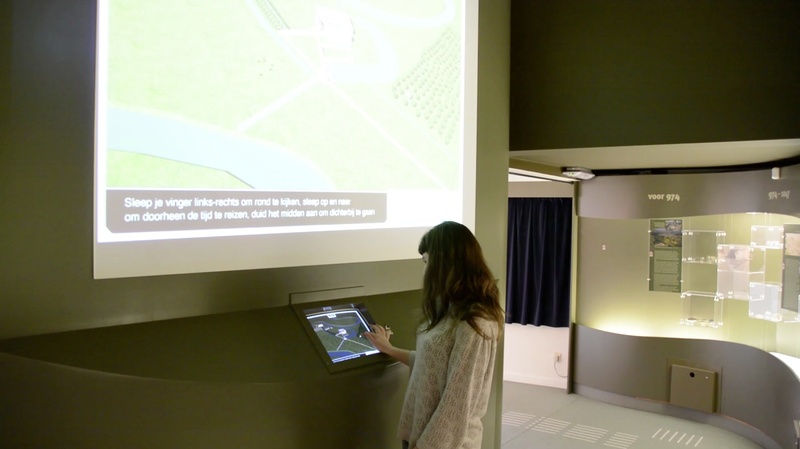 The game is used both as an educational game for school children and as a virtual tour system for guides, and is situated in the Ename visitor centre, overlooking the archaeological site (so that people can see the archaeological site and the real time virtual reconstructions at the same time). This serious game was developed in collaboration with the Digital Arts and Entertainment School (Kortrijk, Belgium) and pam Ename (V- MusT Associated member).